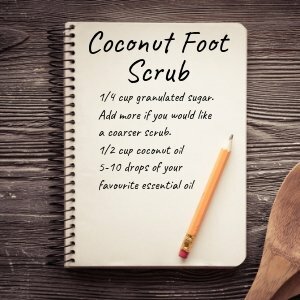 Making a homemade foot scrub with coconut oil is easier than you think! Are you in love with the smell of coconuts? Do you have dry cracked heels? One way you can treat your cracked heels is by using a homemade foot scrub with coconut oil. It’s a treatment that is inexpensive and feels ultra luxurious. Why coconut foot scrubs work. It’s well known that coconut oil is very light and moisturizing. Sugar and salt scrubs exfoliate the dead skin cells off your body and the coconut oils moisturized the new skin underneath. Coconut oil is 100% fat, 80-90% of which is saturated fat. Coconut oil is made by pressing fresh coconut meat or dried coconut meat called copra. One study in patients with mild to moderately dry skin compared the effects of coconut oil to mineral oil, a type of oil made from petroleum that’s often used to treat dry skin. The two-week study found that coconut oil significantly improved skin hydration and was just as effective as mineral oil. 1/4 cup granulated sugar. Add more if you would like a coarser scrub. Store your scrub in an airtight container in a cool dark place. The best way to use your scrub is to apply it after you have rinsed your feet with water. Rub your homemade coconut foot scrub on your feet for a few minutes, rinse off and follow with your favourite foot lotion. Want these free printable tags? 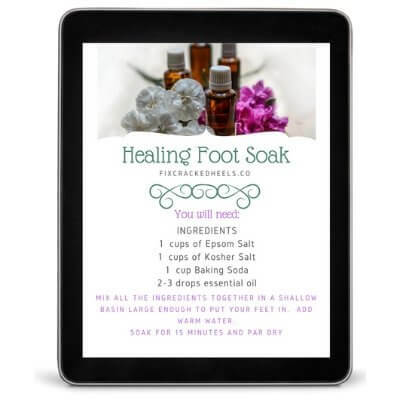 You might be interested in making your own healing foot soak! We have a fantastic recipe for that too!